About 1,400 women are diagnosed with ovarian cancer in Australia each year, and tragically nearly 70% will not win their fight against the cancer. The standard treatment for ovarian cancer is surgery followed by chemotherapy to eradicate any residual cancer cells remaining after surgery. Chemotherapy frequently causes a remission of the cancer – meaning the symptoms reduce or disappear – in 75% of patients. Sadly, though, these remissions are usually short-lived. The cancer begins to progress again because the cancer cells become “chemoresistant,” that is, resistant to the chemotherapy drugs. 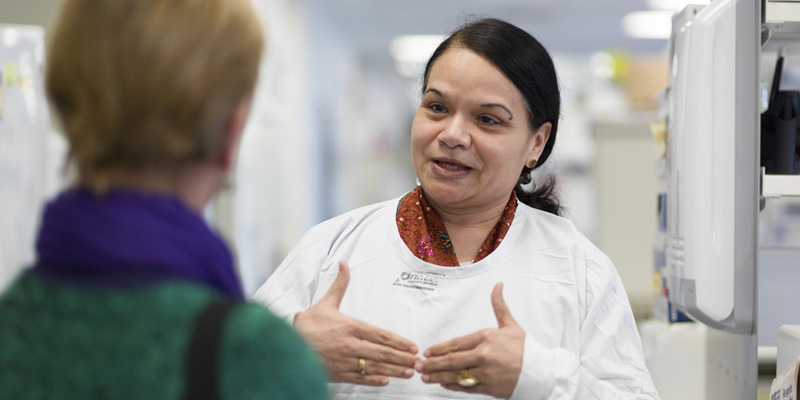 The Women’s Cancer Research Centre wants to understand how ovarian cancers become chemoresistant by studying the genetic differences between tumour samples from individual patients before and after the patient’s cancer has become chemoresistant. By identifying genes and proteins involved in chemoresistance, we hope we will be able to develop therapies that specifically target and prevent chemoresistance.